This year in particular, I feel extremely blessed with some of the opportunities that have come my way. Through all the perseverance with my little space on the internet, I’ve had the opportunities to meet some great people/brands and experience some amazing things. Last Thursday was definitely one of those days where, with huge thanks to Farfetch, I got to visit The Berkeley Hotel for a massage & afternoon tea. I’ll be honest with you, recently I’ve been quite selective with the events that I do go to due to my anxiety being quite high. However, having exchanged a few emails with one of the lovely PR girls at Farfetch a couple of times, I was so pleasantly surprised at how friendly she was that I found myself immediately accepted the event invite. The 16th came around quickly and I have to say I wasn’t prepared for the amazing day ahead of me. I had picked out an outfit the night before featuring my beautiful ted baker high tops and then when I woke up in the morning I suddenly thought, hold on, you’re going to The Berkeley, there’s going to be a smart casual dress code. A whole new outfit change later; crisis averted. I got to the Berkeley hotel quite early and I’m not going to lie, I already felt pretty swish as I walked up to the concierge desk. It’s a grand hotel, no doubt about that. I made my way up to the spa and waited for the others to arrive and once 6 of us had made it up, I realised that this was all of us. Four bloggers and two PR girls. Definitely not what I was expecting but I loved that it made such a nice change. A small intimate group meant that we’d get the opportunity to talk to each other properly and enjoy the experience a whole lot more. Exciting stuff! Laurren had sent us an invite earlier that week telling us that we were going to be treated to a massage and although I knew this was what I was in for, I didn’t expect to receive a full on spa treatment. 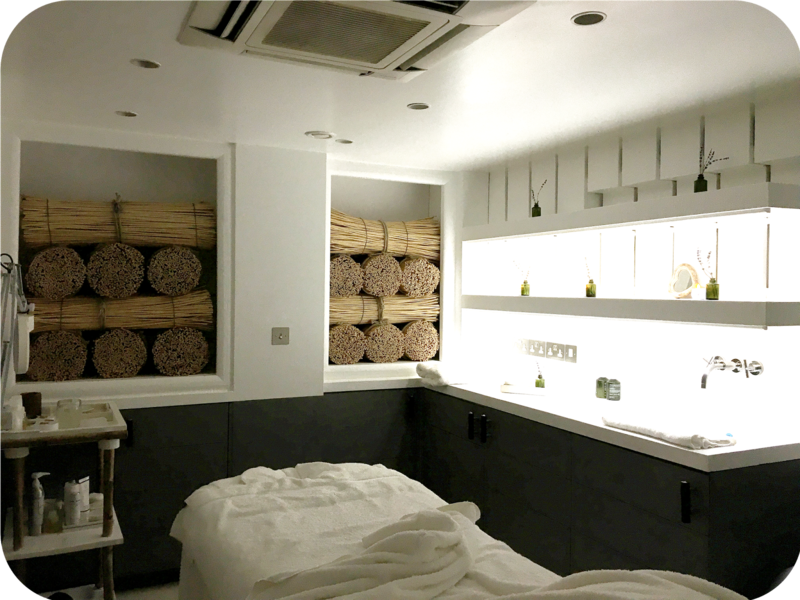 The receptionist explained that we would have a 25 minute treatment and were able to use the pool, sauna and steam room too. How amazing! We got into our robes and slippers and were assigned a masseuse before being taken into a treatment room. I want to say my masseuse was called Carla but I was so overwhelmed with my beautiful surroundings that I can’t be too sure it was. Either way she was so so nice. Carla let me get comfortable and then had me sample three different oils to find one that I liked. I went for the one that smelt of Jasmine and she explained that it was the perfect choice for me because it would help calm the body and uplift the spirit. The massage, you guys, the massage! I don’t think words could do it justice, it was that good. If there’s one thing you do this month you should definitely go and get yourself one. It was literally one of the most relaxing things I have ever experienced and I’m not usually a fan of strangers touching me. 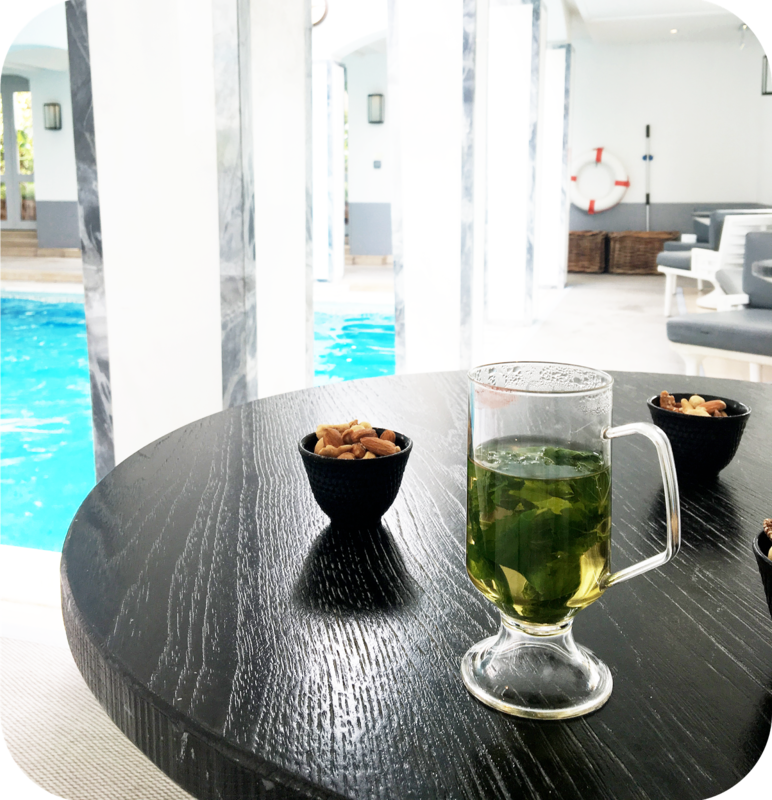 After leaving the treatment rooms, the girls and I headed off to relax by the rooftop pool with our mint tea’s and got to know each other (and our blogs) a little bit better. We talked in great deal about Farfetch and their vision for the future. Farfetch is a British e-tailer that stocks products from 400 independent boutiques from around the world. Since starting up in 2008 they’ve literally gone from strength to strength and by the sound of things they’re only going to get bigger and better. Farfetch have also very recently started stocking beauty products on their website and for those of you who are into quality beauty & skincare products this is big news. It was great to hear just how far Farfetch have come in such a small space of time, so if you’re into serious fashion – watch this space. After our little chit chat we went back downstairs for afternoon tea at Prêt-à-Portea. 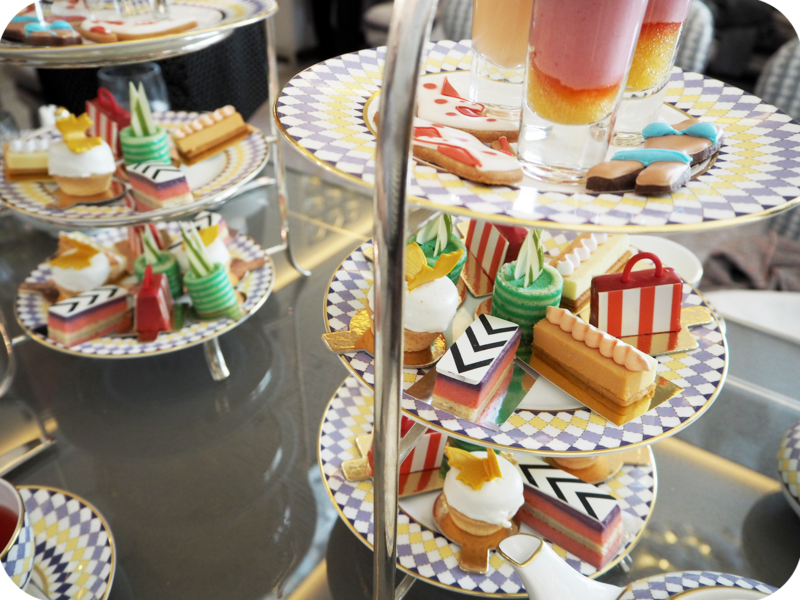 If you’ve never been to the fashionista-inspired afternoon tea, are you really a fashion blogger? 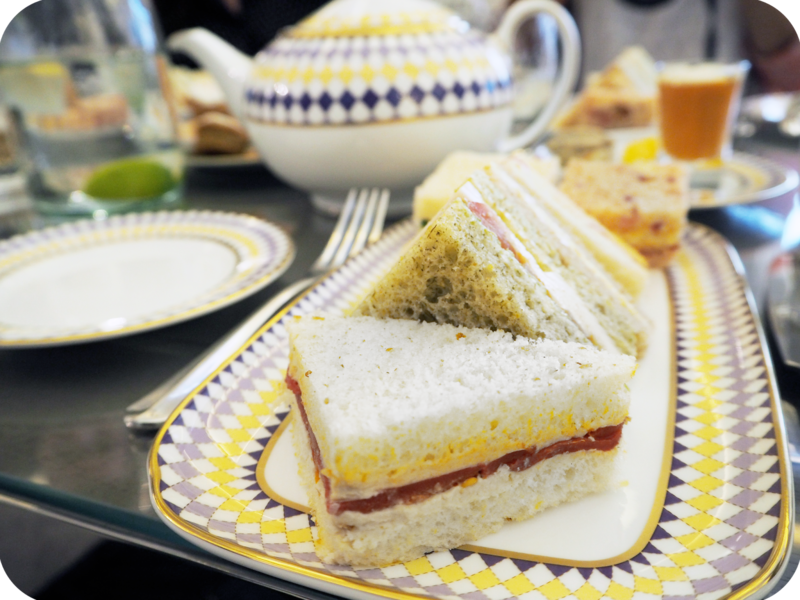 This place had been on my list for SO long and when I found out that we would be having afternoon tea here I could not be more excited! We started off with a selection of sandwiches and a tea of our choice (which could be changed at any time). I opted for the Blackcurrant and Hibiscus tea as I was after something sweet. Initially I intended on changing teas to try out a few but it was so good that I continued drinking it all the way through! I had completely forgotten to mention beforehand that I would need the vegetarian option but the staff were really accommodating and it was no bother at all. I was pleasantly surprised that the vegetarian sandwiches were more than just cheese and cucumber too. After our round of delicious sandwiches it was time for the good stuff. The legendary afternoon tea at Prêt-à-Portea is inspired by all the latest catwalk designs and is transformed every six months to keep up with the new season trends. This season they feature some of S/S16’s runway favourites including Prada’s handbag, Manolo Blahnik’s red polka dot stiletto and Heidi Klein’s halter neck bikini. I tried all three and each of them were truly delicious, if i wasn’t so stuffed I definitely would have devoured the lot. Whilst we enjoyed the tea & treats, the 6 of us talked some more and it was so good to be able to speak freely about the industry with people who just got it. We spoke about expectations vs reality, blogging goals and pet peeves when working with brands. And of course, no good conversation is complete without a discussion of the Kardashian’s! All in all, it was the perfect event. Farfetch were represented so well and I met some amazing bloggers too. A huge heartfelt thank you for such a wonderful day. If you’re thinking of visiting The Berkeley hotel yourself, I highly recommend it. A fantastic experience that will definitely leave you wanting to go back again, I know I will be! You can also find out more about Farfetch and browse their selection of independent boutiques here.